Hi! I’m Shiv Issar and I’m a graduate student of Sociology in India. I’ve been initiating a Teach the Future hub in India and love to share my activities and learnings with you. In the past six months that I’ve been acquainted with Futures Thinking and Teach the Future, I’ve managed to implement elements of Futures Thinking in two projects. 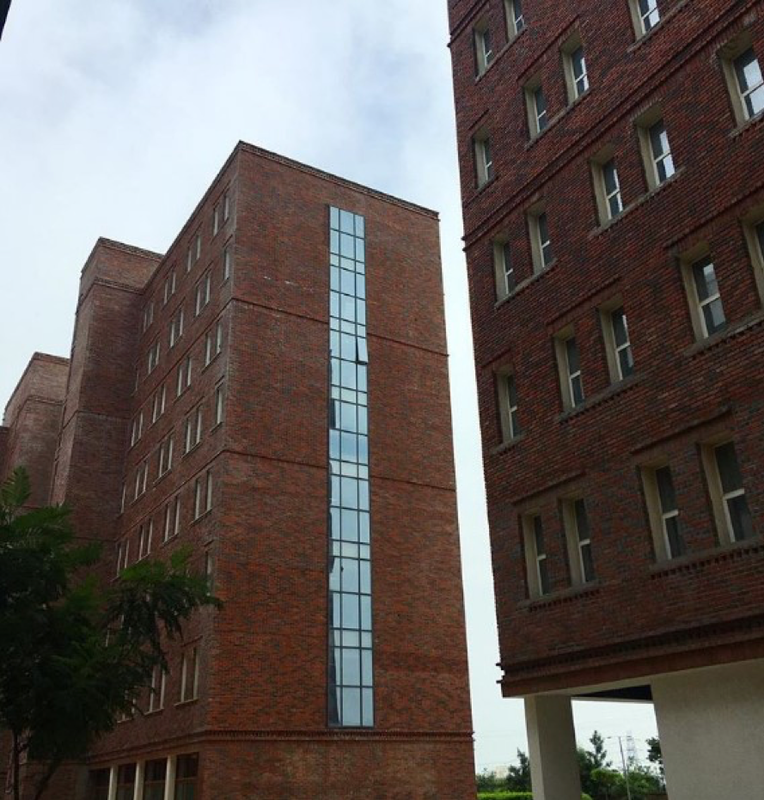 The first of these two projects came my way at Ashoka University in Sonepat, Haryana – a budding liberal arts university that’s roughly about an hour north of New Delhi. At Ashoka, I worked with Dr. Nayan Chanda, an Associate Professor of International Studies, as his Teaching Assistant (TA) for a course on Globalization. 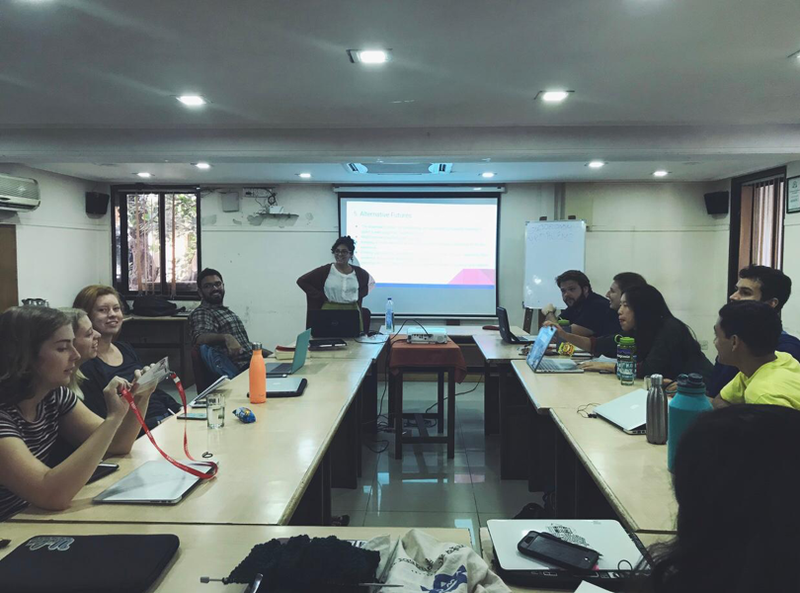 The course was directed towards graduate students of the Young India Fellowship Program – a year-long, multidisciplinary program which pulls in some of the best talent that the country has to offer. Here, my approach towards integrating Futures Thinking within their syllabus was a bit indirect. As a TA, I had the opportunity to conduct weekly discussion sessions for students who had queries regarding the syllabus. Moreover, following the end of each class that Dr. Chanda would take, I would send the students optional content (mostly academic journal articles and YouTube videos - like the one below) which would complement what they had studied in class. I also had the freedom to screen relevant documentaries for the students (outside of the designated timings for their class), every two weeks. Using these avenues, I introduced them to many aspects of Futures Thinking which would be useful for anyone studying varied aspects of Globalization at the graduate level. Some of the TTF library’s content on Globalization proved to be handy here. The “optional content” that I sent in via email featured smaller videos on topics that were worth pondering over scenarios that would concern the future of a globalized, technologically advanced community over the next few decades. The documentaries that I screened in class (Inside Job– 2010, Before the Flood- 2016, The Third Industrial Revolution- 2018 - see trailer below) helped them informally think over the process of scanning an environment, setting a vision, and planning towards achieving it after running through plausible scenarios. Furthermore, it helped them with organically reaching the idea of how to keep a historical trends analysis report relevant, when considering its position with respect to the preceding era/cycle of time that concerns it. In the final discussion session, I introduced them to Framework Foresight, and helped them put all of our preceding discussion sessions within a bigger contextual framework. My second project was comparatively more elaborate. 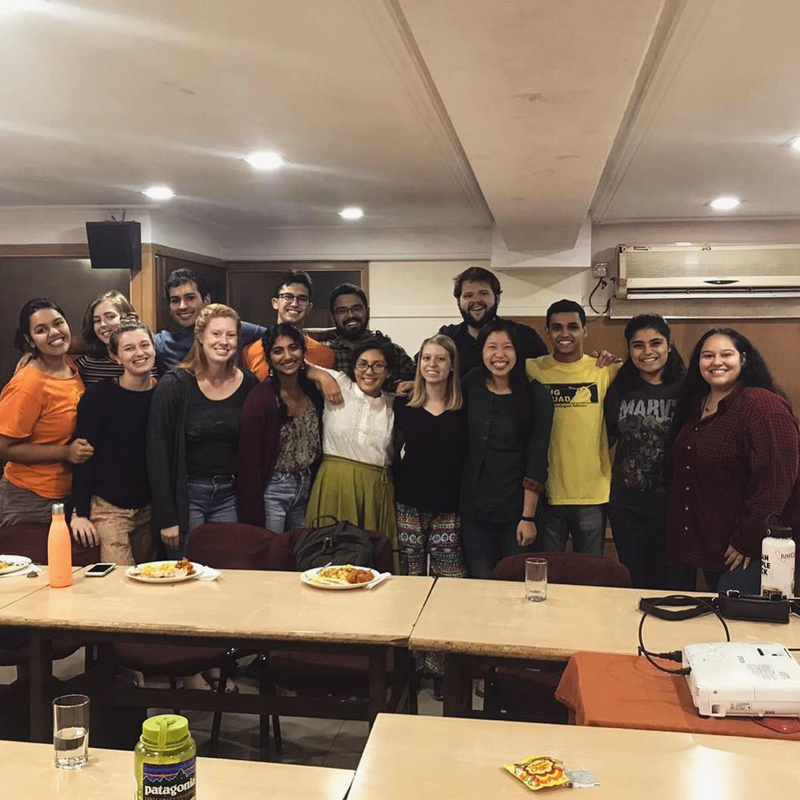 As a faculty for the University of California’s Education Abroad Program (UCEAP) in Mumbai for Fall 2018, I had the freedom to design the course on “India Studies” as I wanted to (as long as I met UCEAP’s academic requirements, of course). 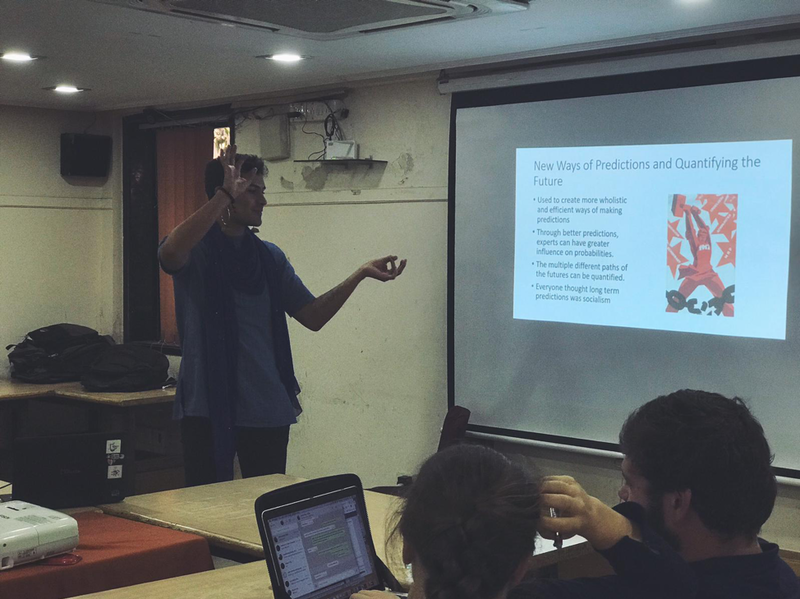 In the due course of structuring the curriculum, I planned out my 3-hour lectures with the intention of addressing several themes that concerned the socioeconomic aspects of life in Mumbai, which is where my students were interning for the semester as well. The themes covered the city’s political and economic history, the nature of its urban ecologies, 21st century casteism, and the facets of labor within the city. The level of rigor that the syllabus offered was roughly around that of what a senior undergraduate student at one of the University of California campuses might expect, which is where all of my students were from. My intention here, was for these themes to inform a STEEP (Social, Technological, Economic, Environmental and Political) analysis that they could use to envision plausible futures within a particular domain. The workshop on Foresight came in towards the very end of the course, keeping in mind what the future of Mumbai might be like. I managed to get the students to go over the Delphi method and a history of academic futures studies (courtesy Jennifer Gidley’s book on the Future) before we got onto using Framework Foresight. Thereafter, we used Richard Lum’s templates for foresight analysis, to draw a comparison between the approaches that professional and academic futurists use. My students were quick to point that Framework Foresight was more flexible and accommodating, and that they were able to trace out a more organic way of thinking within it than they were able to while using Dr. Lum’s templates. Towards the end of the workshop, we discussed how foresight would fit in within the work that they had been engaged with at their internships. The students who had been interning at government-run schools for children from low-income families came to notice how Teach the Future’s curriculum would serve them well. Student drop-out rates are a major concern at these schools, particularly after the children are in middle school, and they took note of how the TTF library would be a major asset for them, if they were to teach or work in a similar setting again someday. While Sonia took us through the rest of it. 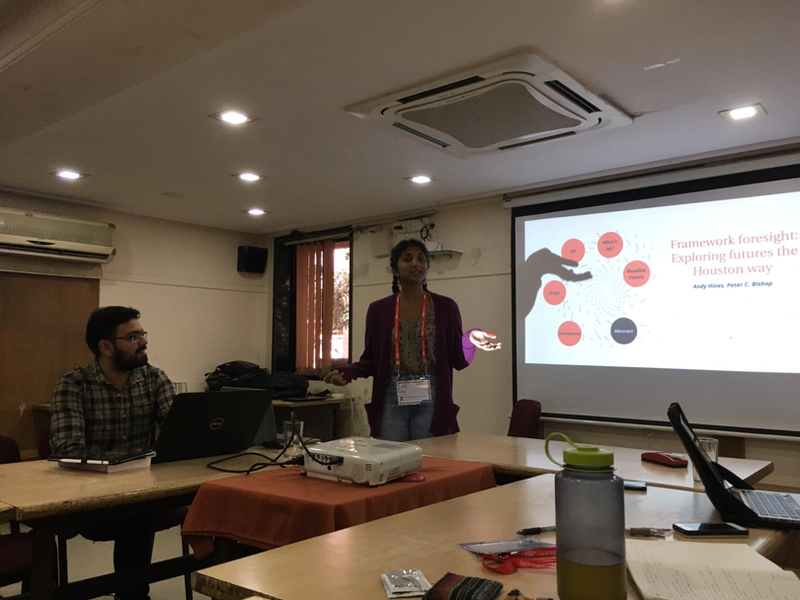 By keeping the Foresight workshop for the very end of the course, and by combining my approach at Ashoka in Delhi with what I’ve been doing in Mumbai, I believe I’ve been able to harness a greater deal of faith in the purpose and use of futures thinking in an academic setting. I hope to continue to improve and/or supplement my approach to it within the classroom as the years go by, and as I turn towards involving more people with Teach the Future – India, I welcome feedback on my work, and ideas pertaining to what could be done in the months that lie ahead of me. Please feel free to reach out to me via mail: shiv.issar [@] ashoka.edu.in, and tell me about your initial experiences with teaching the future! // All pictures used in this blog are Shiv’s own.